Chungking Express is, for my money, unquestionably a masterpiece, but one of the most delightful things about it is that it's something of an accidental masterpiece. The film was conceived as a distraction for director Kar-Wai Wong, who at the time was embroiled in the editing of another film, Ashes of Time. The latter was a big-budget historical epic that he was struggling to shape in the editing room, so he took a break for a couple of months and made a small, scrappy contemporary film as a way of working through whatever creative issues he was dealing with at the time. Once Chungking Express was completed, he was able to return to Ashes of Time with renewed vigour and energy. In the process he had someone made not only his best film, but also one of the best films of the 1990s, without even meaning to. It's probably the best argument in favour of procrastination in the history of art. 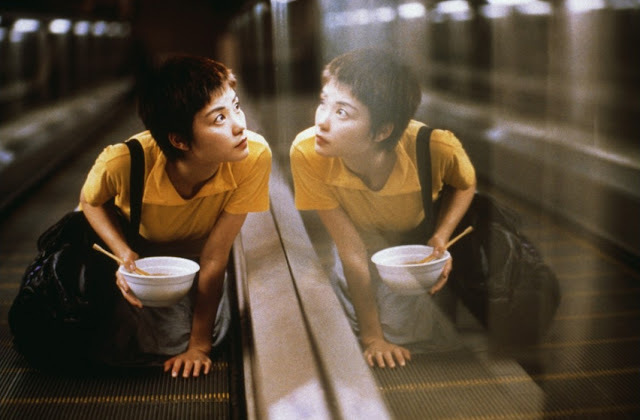 The on-the-fly scrappiness of Chungking Express's production bleeds into its story, or more accurately its stories, which have a vibrant unpredictability that suggests they were being written as they went along. Set in Hong Kong, the film is split into two separate, slightly unequal halves, both of which revolve around the love lives of lonely policemen. The first story follows He Qiwu, a.k.a. Cop 223 (Takeshi Kaneshiro), a man who has recently become obsessed with the impermanence of things. Having broken up with his girlfriend on April Fool's Day, he hopes that their break-up must on some level be a joke, and he decides to let the gag last for a month; if May (the month) comes and May (his ex-girlfriend) doesn't come back to him, then he'll know it's truly over. During this time he falls into a routine of buying cans of pineapple, all of which are due to expire on the 1st of May, for reasons which may only make sense in his lovesick mind. On the first of May, he meets and falls in love with a mysterious woman (Brigitte Lin) who, unbeknownst to him, is part of a drug smuggling operation and is on the run from her partners. The second - and longer - story centres around Cop 663 (Tony Leung), who is also dealing with the aftermath of a break-up. He befriends and becomes the object of affection for Faye (Faye Wong), the whimsical waif who works behind the counter of the snack bar he frequents. The two bond over music - she loves anything that's loud; he claims to not know anything about music - and food, or rather she berates him for drinking too much black coffee. Nevertheless, there is something between them, and when Faye gets a hold of a key to Cop 663's apartment, she starts making clandestine visits to his home, tidying up the place and secretly improving it for him. It's just the right side of stalkerish to be endearing. Though the two stories play out different and have wildly contrasting tones - the first is closer in style to As Tears Go By, the frenetic gangster film that was Wong's directorial debut; the second is much less heightened, though no less vibrant - they nicely complement each other as tales of people making brief, yet profound connections amongst the thrum of a big city. Almost every character in Chungking Express is lonely. Both Cop 223 and Cop 663 are obviously smarting from their recently ended relationships, whilst Faye's effervescence seems to mask a lack of connections with any real substance to them. The irony of the film is that even though the characters all live in a densely packed city that is so bustling and active, they all lack some basic human connection in their lives, be it love or friendship. Wong and his cinematographer, Christopher Doyle, emphasise this idea by showing almost nothing of the broader city of Hong Kong. There are almost no establishing shots - probably because of the rough and ready way in which the film was shot - and much of the focus is on how the characters fit into their immediate surroundings and how they are placed relative to other people. The focus is so close that it's almost possible to imagine that nothing exists outside of the immediate area of the frame. The images in the film are beautifully composed, yet have a dashed off feel to them, as if they just happened to look that gorgeous, and the film is edited with a playfulness that is infectious. Like Godard back when he was fun. All this creates a film in which the characters are islands of calm amidst roiling seas of activity. Quiet, self-contained, but ultimately isolated. This is perhaps most apparent in Lin's character, even though she is, of the four principles, probably the least central to the story and initially seems to be the most comfortably independent. She is introduced as someone who thrives amidst the seediest elements of Hong Kong society, hiring drug mules whilst surrounded by grime and the messiness of life, yet when things go wrong she has no one to turn to. Her isolation is quite different to that of the other characters - her loneliness is that of the hardened criminal who struts around in sunglasses and a raincoat, brandishing a gun - but her chance encounter with Cop 223 in a bar reveals that, for all her affectation, her loneliness leads to the same place as his. Ultimately, his attraction to her might prove fleeting and insubstantial - after all, he only talks to her because he decides that he is going to fall in love with the next person he sees, being young and impetuous and whatnot - but their interaction promises to be just as profound as that being Faye and Cop 663, even if it lasts a fraction of the time. Although Cop 223's story is sweet and exciting, it almost feels like little more than a prelude to that of Faye and Cop 663. So much so, that when I re-watched the film for the first time in nearly six years, I found myself struggling to remember any of the first story whilst vividly recalling almost all of the second, right down to individual, minor movements by the actors. The character of Faye veers slightly too closely to the trope now known as the Manic Pixie Dream Girl, the magical character who exists to make the life of a male protagonist better, but Faye Wong's performance is so charmingly uninhibited that it completely lacks any of the archness that can make that character type so difficult to stomach. She is believable as someone who would fall so hard, and so completely in love with someone, that they would consider breaking into his apartment to improve it the proper and logical thing to do. It also helps that Wong Kar-wai uses California Dreamin', one of the all time great pop records, as a recurring motif for Faye, one which perfectly captures the hope and plaintive optimism of the character, whilst maintaining an autumnal sadness that undercuts the whimsy. Meanwhile, Tony Leung is so heartrendingly lovelorn that you can't help but want someone to come along and fix him, even if that person's methods probably needed to be reconsidered before implementation. One of the key emotional moments in the film comes from a simple gesture: Tony Leung drinking a cup of coffee after being told that his ex-girlfriend has left a letter for him at the snack bar. Wong Kar-wai shoots the moment using a juddery slow-motion effect that he otherwise employs to heighten the emotion of action sequences like gun fights or chases, but here he uses it to stretch out and deaden the emotion, to make it last for a painfully long time. As he drinks his coffee at an agonisingly slow speed, Wong and Leung convey elegantly and wordlessly the crushing sadness of cop 663 as he is reminded of what he has lost. It's a glorious moment that encapsulates the impressionistic style of Wong Kar-wai's films; seemingly simple and banal moments that tell the story of someone's entire life, if only we learn to view them in the right way. It's a wonderfully humanistic viewpoint that becomes all the brighter juxtaposed against the harsh neon glare of modernity.